“Today’s extra special because you turn one. What an exciting time to celebrate with your baby and capture their little character as you celebrate the exciting year you have shared. 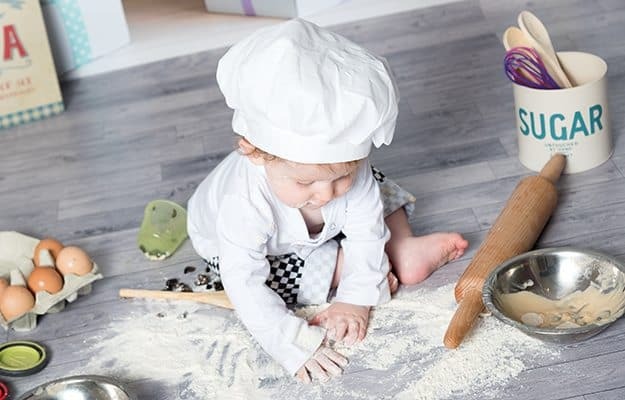 Choose from one of three styles of birthday celebrations including a fantastically sensory baking photoshoot, a cake smash with all their messy goodness, or stick with more natural photos and sets that include balloons and bunting to mark the occasion in a cleaner fashion. I am able to provide you with props and outfits for the photoshoot to give your images that little extra something at no extra cost to yourself. I also provide the cake smash cakes from a local baker and design the sets in conjunction with your ideas. For babies that don’t like cake, or maybe have a food intolerance, why not consider a ‘cake making’ photo shoot. These fantastically messy shoots allow us to fill the bowls with all your little ones favourite food so gluttonous eating and sensory fun can be enjoyed by all! A cake smash is the perfect way to celebrate a 1st birthday! 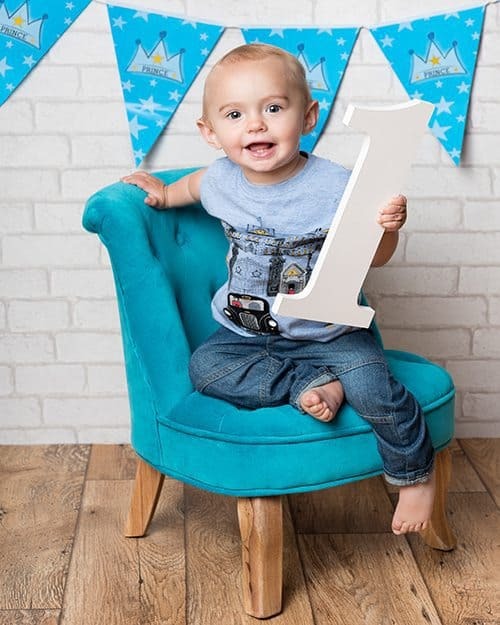 Whether they eat it, smash it, poke it or throw it, those cake covered little faces guarantee that you will walk away from their first birthday photoshoot with some wonderful photos and stories to share with your child as they grow up. Gemma was so patient with my baby and had so many fab ideas, can’t wait to see the photos. Your baby’s first birthday photoshoot will take place in more homely of the two photography studios. Simple and cosy, the Baby Suite has all you need when it comes to young babies including a full height baby changing table for your comfort and plenty of space to unpack your baby items. Utilising the sofa, bed and studio walls, this room can be customised to suit your session, from simple baby photos with neutral coloured balloons, to bright cake smash sets. A comfy sofa also provides homely and relaxed seating area for spectators. Parking is directly outside the unit for your convenience. Every photoshoot at Enchanted Photography is unique to you and your family. I want you and your baby to feel at ease in the photography studio, so I’d love to hear more about your little one, their likes and dislikes. I will share my 8+ years experience of photographing babies and let you know what will look great during the session. 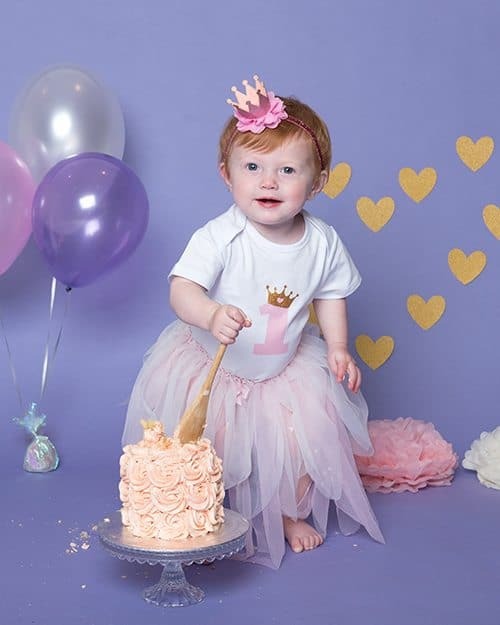 Whether you are opting for a naturally styled first birthday set, or a 1st birthday cake smash/cake making photo shoot, I want to work with you to design sets and choose props and outfits to create that perfect first birthday vibe with amazing photos to match. All first birthday photoshoots start with a clean baby. As a baby photographer I love to start the session by capturing some natural photos of your baby’s character using a selection of little chairs, suitcases and birthday themed props. We can then continue with more natural photos, or move onto your little ones custom designed baking/cake smash set. Balloons, pom poms, whisks, spoons, cake stands and so much more can be used to decorate the set as you little one gets messy. Tub time is a favourite for all babies so almost all the 1st birthday photoshoots end with a chance for your little one to have a splash. Rubber ducks keep your little one company as they soak in the bubbles. We’ll meet again at the studio one week later, where you can all make yourselves at home on one of the big cosy sofas in front of the fireplace to see a slideshow of the super cute and character filled images we created at your photoshoot. Your time in the viewing room is incredibly important and we don’t want to rush it! This is the time where we will go through each one together to help find your favourite picture perfect moments to hang in your home as well as the ones you want to purchase digitally to share with friends and family. To book a 1st birthday baby photoshoot there is a booking fee relevant to your preferred session type as detailed in the grids below. I sell a selection of high quality printed products, built to last the test of time, these included fine art canvases, acrylic panels, photo cubes, albums and more. You can also choose to purchase your favourite images to be provided as high resolution digital files priced from £199 to £349. These are perfect for storing on your mobile phone, sharing on social media and getting printed photos made from. Selection of props to celebrate their first birthday including wooden cakes, sit on car with ‘1’ emblem, birthday boxes, wooden ‘1’ etc. 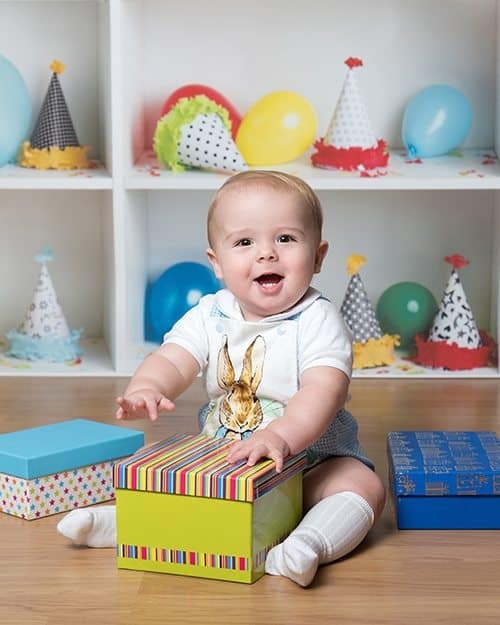 Natural baby poses to celebrate their first birthday including a selection of birthday props for example wooden cars, car with ‘1’, birthday boxes, wooden ‘1’ etc. My brother and baby nephew had a fantastic time with Gemma in her Maidstone Photography Studio and the pictures were incredible. We had them blown up on A1. It made the perfect birthday present. Thank you Gemma for our wonderful family photos. Highly recommend to anyone in need of a baby photographer. Babies can sometimes have more bags than the families, but within the studio you will feel at home with room to unpack and relax with a full height changing table for quick fixes and outfit changes. The chesterfield sofa makes a perfect perch for a spectator or two to come along with you to watch your baby celebrate this milestone in all it’s glory. These are photos you want to treasure forever. Backgrounds and props are chosen for the comfort of your baby as well as for the ascetical value of the images for your home. 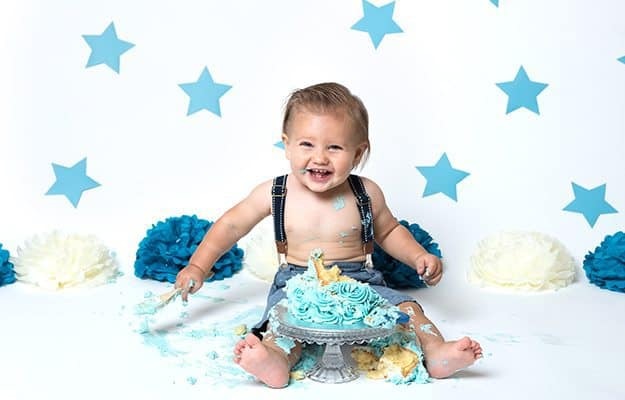 For cake smash sessions an exceptional, professional cake-maker will create the perfect cake smash cake for you with the right amount of mess and ‘break’ for little hands. These can also be customised to dietary requirements if needed. With more than 8 years of experience and many hundreds of photoshoots undertaken all sessions remain baby led. Babies are so tiny deserve the respect to be treated with the utmost care when taking their photo. Trained to a high standard in Baby Safety I use a multitude of techniques to get the best images of your child. I understand you will want high quality digital copies of your favourite images to share with your friends and family so these are included as standard with the entry prices. As parents you’ll no doubt also want your favourite photos to put up in your home so I also offer a wide range of high quality printed products for your home. Don't forget to like the Facebook Page for latest info, offers & photos from recent family photoshoots. Copyright for all content held by: Enchanted Photography. All Rights Reserved.